M (US10):---------Bust--37.0" Length--29.1" Sleeve--7.5" Shoulder--15.3"
L (US 12):---------Bust--39.0" Length--29.9" Sleeve--7.9" Shoulder--15.9"
XL (US 16 ):------Bust--41.7" Length--30.7" Sleeve--8.5" Shoulder--16.5"
XXL(US 18):------Bust--44.5" Length--31.5" Sleeve--9.0" Shoulder--17.2"
It is extremely soft,comfortable and high stretchy. Both of machine washable and hand washable are available. Occasion:Daliy wear,office,dating,club, meeting,party, home,work, etc. 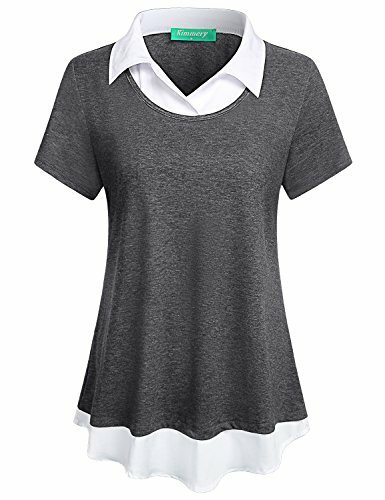 This Fashion shirt pairs well with capris, leggings,jeans or other casual pants.